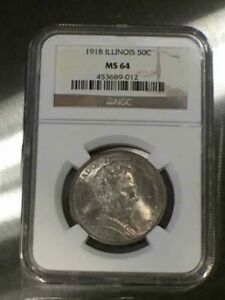 The Illinois Centennial half dollar is one of the few real success stories in U. S. commemorative coinage. A superb piece of sculpting, its appeal as a work of art is just as evident today as it was in 1918. 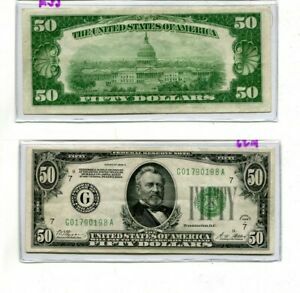 The entire authorized issue was sold; although many pieces remained on hand in Springfield banks as late as the 1930s, none were ever returned to the Mint for melting. Additionally, the money raised from sales of these coins was actually used for the legitimate and honorable purpose that Congress intended, never a certainty with such coin programs. 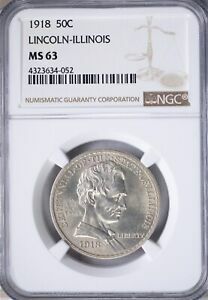 Last but not least, collectors prize these half dollars, as they bear one of the most attractive designs in over a century of commemorative coinage. The most prominent feature of this issue is the portrait of Abraham Lincoln, Illinois' best known resident (with the possible exception of Al Capone). 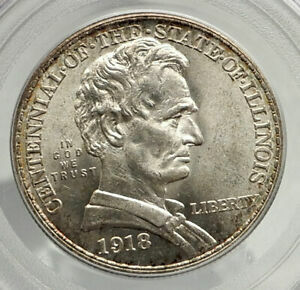 For that reason, some have called it the "Lincoln" half dollar, but it actually celebrates the centennial of Illinois' statehood. What is now the state of Illinois was once a part of the vast Northwest Territory. Its name is a French corruption of the native word Iliniwek, which described a consortium of Algonquin tribes. Captured from the British during the American War of Independence, Illinois was included within the new Indiana Territory in 1800. Nine years later, it became the Illinois Territory, ultimately achieving statehood on December 3, 1818. Abraham Lincoln was not a native of Illinois, arriving there as a young adult of 21 in 1830. Still, he is indelibly linked with this state. By a peculiar coincidence, his birth occurred just three days after the establishment of the Illinois Territory. Largely self educated, Lincoln is fondly remembered for his proficiency in splitting rails, but it was as a lawyer that he achieved prominence during the 1830s and 1840s. Several terms in the state legislature were followed by two unsuccessful bids for the United States Senate. It was during his second campaign in 1858 that his skill as an orator brought him national recognition. Losing to Democrat Stephen A. Douglas, Lincoln nevertheless impressed his Republican Party enough to become its candidate for the presidency of the United States in 1860. His election led to withdrawal from the union by a number of southern states, culminating in the Civil War. Lincoln's determination and strength saw the nation through that troubled time, but it ultimately cost him his life. He was assassinated by a Confederate sympathizer only a few days after the war's end. The Placement of his portrait on this commemorative coin speaks volumes about the pride that the people of Illinois take in calling him their own. 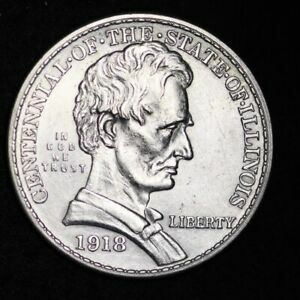 Legislation passed on June 1, 1918 authorized the coining of not more than 100,000 Illinois Centennial half dollars. The proceeds were to fund centennial celebrations being held by counties throughout the state. 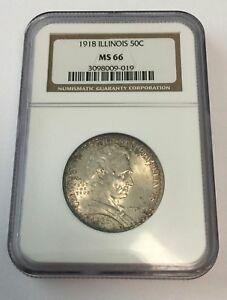 As these events were already underway when the bill became law, the expeditious coining of the Illinois half dollars was a must. 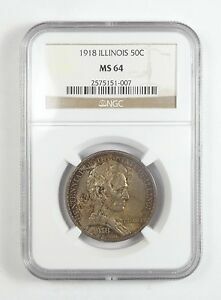 So the work of preparing models based on designs furnished by the Illinois Centennial Committee was performed in-house: The Mint's Chief Engraver George T. Morgan sculpted the obverse, while his newly-hired assistant, John R. Sinnock, completed the reverse. Both artists ultimately designed many U. S. coins, although most of Sinnock's achievements were still some years in the future. The Illinois seal, selected for the reverse of this issue, depicts an eagle holding in its beak a banner inscribed STATE SOVEREIGNTY and NATIONAL UNION. Despite instructions by Treasury Secretary William Gibbs McAdoo that the Illinois motto be replaced with the United States motto E PLURIBUS UNUM, the change was not made. Apparently, the state committee's influence in Washington was sufficient to block this action. Still, the national motto was added to the field in small letters, along with the other statutory inscriptions. In a letter to the superintendent of the Philadelphia Mint conveying the secretary's instructions, Acting Mint Director Mary O'Reilly placed particular emphasis on the fact the the models must include the year of coinage. 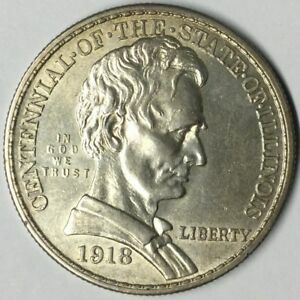 This is interesting in light of the fact that only the date 1918 appears on the Illinois half dollar, whereas most anniversary issues included both dates of the span, such as 1818 - 1918. It may be that the original models bore the date 1818 alone or none at all. The answer to this question has not survived. The obverse of the Illinois Centennial half dollar features a right-facing bust of Abraham Lincoln. He is beardless, looking as he did during his Illinois years. This portrait is based on Andrew O'Conner's full-length statue of Lincoln unveiled at the state capital of Springfield in August of 1918, the same month that the coins were struck at the Philadelphia Mint. The inscription CENTENNIAL OF THE STATE OF ILLINOIS is arranged around the periphery, while the mottoes IN GOD WE TRUST and LIBERTY appear in the field. 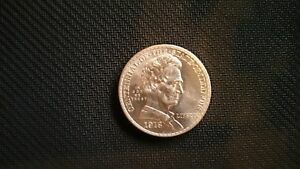 Below Lincoln's bust is the date 1918. The reverse features Illinois' state seal: A defiant eagle is perched upon a rocky mound and the federal shield, clutching in its beak a banner inscribed with the Illinois motto STATE SOVEREIGNTY NATIONAL UNION. A rising sun is at right, while an olive branch passes behind the shield. UNITED STATES OF AMERICA and HALF DOLLAR are arranged peripherally and separated by dots. 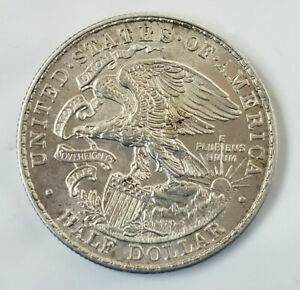 The border, as on the obverse, is comprised of a bead-and-pellet configuration, in similar fashion to Hermon MacNeil's Standing Liberty quarter dollar of 1916-30. Finally, the motto E PLURIBUS UNUM appears above the sun in small letters. All of the 100,000 pieces authorized were coined, plus an additional 58 which were reserved for assay and later destroyed. Although sales were strong, at least 30,000 coins remained on hand following the centennial, as that number turned up in just one Springfield bank during President Franklin D. Roosevelt's Bank Holiday of 1933, when federal auditors stumbled across quite a few hoards of forgotten, old coins. 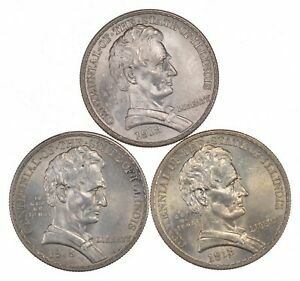 Most of these Illinois halves were parceled out to dealers at a small premium over face value, while the remainder were probably issued to circulation as part of the regular coinage, joining the many coins of this issue already spent by persons devastated by the Great Depression. 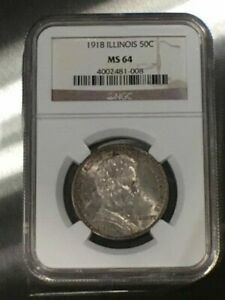 Because so many Illinois halves were spent as money, lightly circulated pieces are quite common. 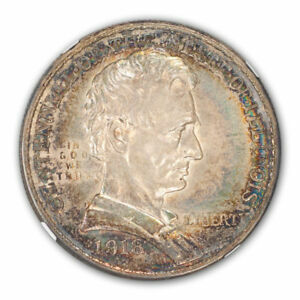 More heavily worn examples were probably pocket pieces at one time. Still, the sheer number of coins issued has made this design plentiful in uncirculated condition, as well. The typical specimen encountered has attractive, frosty luster, although it will likely have more than a few contact marks. 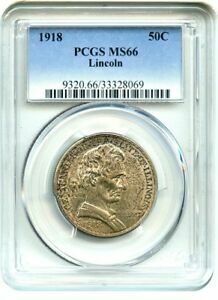 This is especially true of the obverse, both Lincoln's portrait and the field showing nicks and reeding marks of varying size and depth. 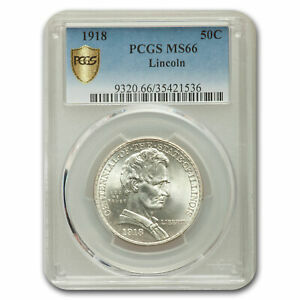 The complexity of this coin's reverse tends to camouflage whatever contact marks are present, and this side will often seem superior to the obverse. 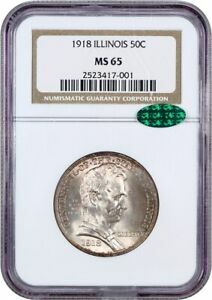 For this reason, the Illinois half dollar is usually graded more by its obverse than its reverse. 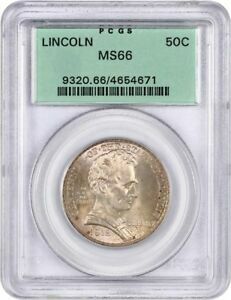 Most mint state specimens fall within the range of MS-60 through MS-63. Higher grade examples are scarce. 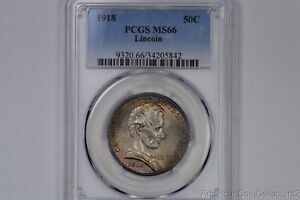 Beware of coins which have been harshly cleaned or lightly circulated. Points to check for wear include Lincoln's cheekbone, jaw, eyebrow and the hair above his ear. On the reverse, examine the eagle's breast feathers and the grass beneath its left claw. A few coins will show weakness of strike in these same areas; the presence of luster distinguishes this from actual wear. No official packaging accompanied the Illinois half when it was issued, but a number were fitted within shield-shaped badges worn by participants in the centennial celebrations. These have collectible value, and several varieties of ribbon colors may be found. In addition, two satin-finish proofs are known of this commemorative coin, and one or more matte proofs are rumored to exist. 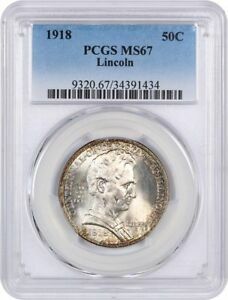 Although the regular-issue coins are usually well struck, these proofs are extremely so. A very few pieces were coined in off-metals as die trials. These include copper (Pollock-2062), nickel (P-2063) and white metal (P-2064).